OjO Commuter Electric Scooter will get you across that “last mile”. Commuting in big cities is a challenge that’s only getting tougher every day. Many people tend to think getting a car is the solution to their personal commuting problem. Unknown to them, getting a car would only compound an already existing problem. Cars are big. And big cities hardly ever have enough space. This makes cars and urban centers a bad match. It’s evident in the traffic congestion commuters have to fight through every day and the lack of parking space that seems to plague you everywhere you go. The environmental impact of having too many cars on the road is also massive. Our personal vehicles are a major cause of global warming. Collectively, cars and trucks account for about 20% of all emissions in the United States. It is no surprise, therefore, that innovative solutions in the form of New Mobility Services are being developed. The OJO commuter scooter is an electric scooter that hopes to address the known problems associated with the currently available facilities in many ways. For one thing, it’s unlike other electric scooters out there. The OJO electric scooter offers a fine blend of solid range, smart features, and a promise of exhilarating rides. No other scooter has been able to combine all these features in a smart package – one that ensures other commuters take at least a second look anytime you cruise by. It is built to be bike lane friendly, a feature that’s absent in most other scooters. The electric nature of the scooter means it has zero emissions, as long as you charge it with a renewable energy source. Furthermore, the compact build ensures it takes less than a tenth of the space your regular car would occupy. You can easily wriggle through traffic congestion and get to your destination in record time. In addition, you do not have to search for a parking space that may be miles away from where you are going. Combine these with the pleasing aesthetics and you have the perfect solution to personal as well as environmental commuting problems. 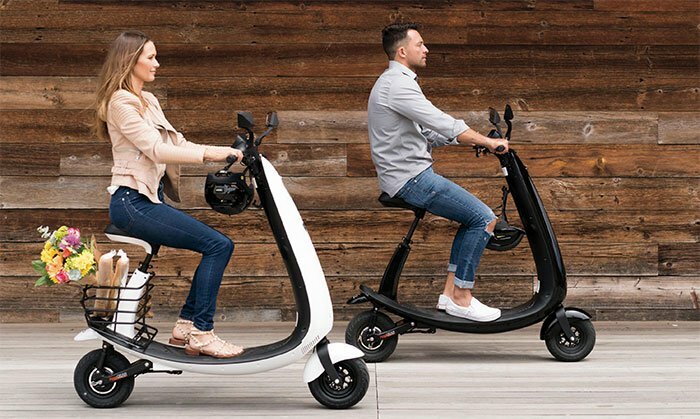 The OJO electric scooter is a smart two-wheel scooter. You do not have to squint to notice that it looks very cool on the eye. However, the scooter does not stop there. It comes with a patented ergonomic design that helps you avoid the back, neck, and joint pains that often come with riding on two wheels. The HyperGear motor and its unique gear system ensure you have no problems cruising on hills and mountainous paths. The scooter is further equipped with a patented onboard charger with a retractable cord and plug. You can easily charge at any standard 110V wall outlet. Sustainability and safety remain the major themes surrounding the future of the transportation industry. The OJO electric scooter effectively ticks both boxes and it presents the perfect solution to personal commuting. The scooter promises unparalleled quality and fun while delivering maximum satisfaction to commuters.